When Colourpop had their 'free international shipping' offer a few weeks ago, I really couldn't turn down the chance to get my hands on some of their products. Having seen them raved about all over Youtube, I went for some of their most popular products: an Ultra Satin and Ultra Matte lip, along with an eyeshadow and blusher (more to come on them in future blog posts!). 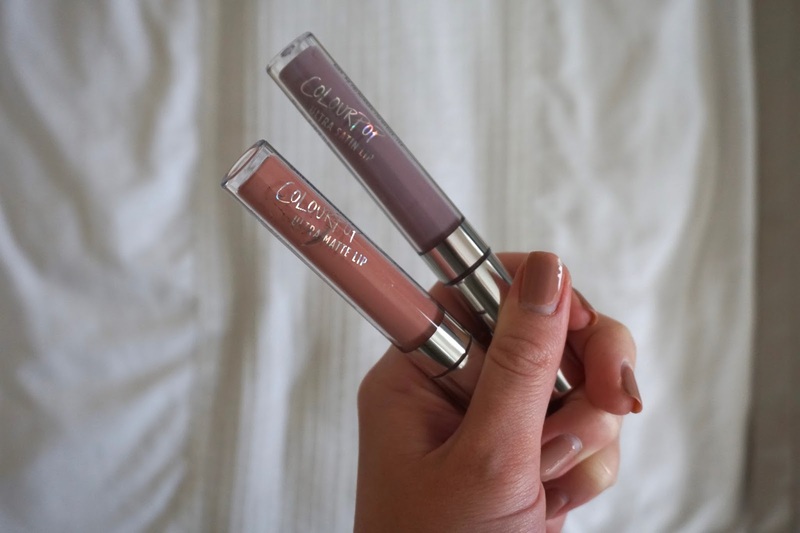 The shades I was drawn to was 'Trap' from the Ultra Matte range, and 'Marshmallow' from the Ultra Satin range. 'Trap' is a beautiful grey toned pink shade, perfect for autumn/winter and a really unique colour that would be difficult to dupe. 'Marshmallow' is another unique shade - a cool toned lilac/purple shade, darker than the MUA one I posted about last month, but still nowhere near a darker berry purple shade. I've worn both of these shades in looks on my Instagram, so click to see Trap and Marshmallow. As you can see, Trap looks much darker on me than it looks in the tube, but I actually love that as it just makes the colour even more unique for me. In terms of the formula, I have been pleasantly surprised. The Ultra Matte definitely is completely matte, and although I do find it more drying than my Dose of Colors or Lipland liquid lips, it isn't uncomfortable and it is definitely long wearing. I also like that it doesn't cling or dry weirdly in any lines or drier areas - although I always recommend exfoliating and using plenty of balm when you use liquid lipsticks. The Ultra Satin is a lovely formula, and a nice change from a matte lipstick. It still has all the opacity and pigmentation of the matte formula, but dries with a slight sheen to it. It doesn't feel drying at all, although the only thing I would say is it feels slightly thicker on the lips than the matte formula. I love the colour though, and I've had so many compliments on it! Have you tried anything from Colourpop? Let me know in the comments. Quick Colourpop US to UK review: Delivery probably took around 10 days, and it was free over $50 as they specified in the offer. However, I was hit with a pretty hefty customs fee, as anything over $15 is now being charged apparently. I kind of saw this as paying for the delivery, but I wouldn't recommend paying for delivery and then customs as you'll probably pay twice for the products! They are lovely products, but I'd definitely be wary of ordering to the UK again.